Creekmoor is A Lifestyle Community! Golfing, Hiking, Boating, Fishing, Swimming and Tennis. All right at home! It's a lifestyle. Featuring Award Winning Builders! Creekmoor offers a variety of styles and price ranges. Welcome to Creekmoor – MORE THAN A COMMUNITY. It’s a lifestyle. Golfing, Boating, Fishing, Club House, Exercise & Weight Room, Swimming, Tennis, Pickleball, Jogging & Biking Trails. Community School plus an Abundance of Local Shops & Services. Lifestyle? Come and Take Your Choice! You can have a Boat Dock and Championship Golf Course right in your Backyard! Creekmoor is a master-planned community anchored and designed around two main centerpieces – Lake Creekmoor – a private 108 acre lake – and the acclaimed Creekmoor 18 Hole Championship Golf Course. At nearly 1,000 acres, Creekmoor is among the largest residential communities in Kansas City and the surrounding region and offers one of the most comprehensive Residential Amenity Packages available. 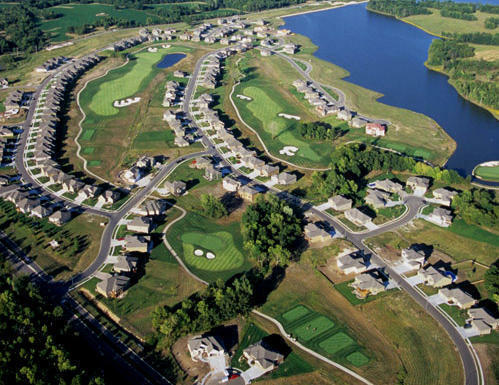 Creekmoor Lake and Golf Course gently wind and curve around the various neighborhoods and provide a spectacular backdrop for home settings, golf, lake and outdoor enthusiasts. Creekmoor offers one of the most comprehensive amenity packages in the KC area. Creekmoor is a suburb of the Kansas City Metropolitan area. Many residents would describe Raymore as a small town within a big city, yet offers an abundance of shopping and services. Raymore offers the best of both worlds – a small town atmosphere – yet within commuter distance to the Metro Area. Many residents commute to employment centers in adjacent Jackson and Johnson Counties taking advantage of an excellent network of highways and freeway connections. Cass County youth receive a superb education in public schools districts that are recognized in Missouri and nationwide for their progressive programs and unwavering commitment to excellence. Creekmoor is served by the AAA Rated Raymore-Peculiar School District. Creekmoor Elementary (K-4) is physically located within the Creekmoor Subdivision. In addition to Lake Creekmoor, close by are some of the larger most popular fishing and boating lakes in the Kansas City area such Lake Jacomo, Longview Lake and Truman Lake to name a few. With Cass County’s southern location within the Kansas City Metro Area, Creekmoor residents enjoy a head-start when making the trip to the expansive Missouri lakes region, which is one of the prime weekend getaway spots for Greater Kansas City. Raymore is essentially the “Gateway” to the Ozarks from Kansas City. Experience the Creekmoor difference . . . Call or Visit us Today! Featuring Award Winning Builders and offering golf, lake, boating and fitness amenities, Creekmoor is a Cooper Land Development, Marketed by ReeceNichols Realtors - a Berkshire Hathaway Company.